Resources to support leaders in delivering the new programme will be put directly into the hands of the Leader in Charge of each age group alongside the Gazette, 3 times a year. The new resources will feature programme ideas and activities through a set of Activity Cards, Themed Activity Cards and a Programme Planner for each term. The resources will be delivered at no additional cost to the Company. Over time, a Leader will build up a library of activities covering a wide range of activities across all the programme Activity Areas. All of the resources will provide Leaders with support in planning their programme and are not designed to be a syllabus which has to be followed. Resources will be accessible to download through a searchable library on Online Brigade Manager (OBM) to all leaders. Using the Activity Cards, a Leader will be supported to deliver a dynamic and varied programme each year and avoid repetition. Each term a set of Activity Cards will provide Leaders with ‘ready-to-go’ activities which means the card contains all the information a leader needs to organise the activity successfully. The Activity Cards will be delivered as A4 laminated cards. 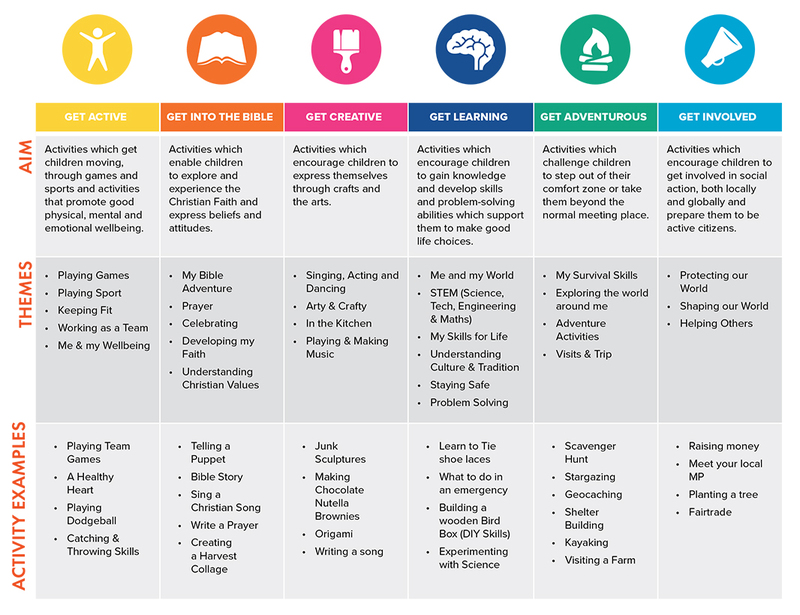 There will be one Activity Card for each of the 6 Activity Areas each term. Additional Activity Cards will be added online but only 6 Activity Cards will be distributed in a printed format each term. A box file will be available enabling all the Activity Cards to be kept in one placed and organised by Activity Area keeping them easily accessible so Leaders can come back to them again and again, although we will always be adding new activities in to ensure the programme does not become stale or repetitive. 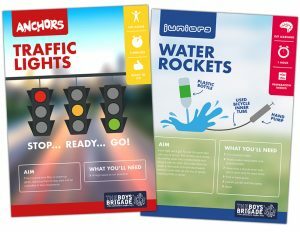 These will bring together activities from several of the Activity Areas based on a theme with 4 themed Activity Cards being delivered each term. Usually these cards will feature at least 5 activities from at least 4 different Activity Areas. These Themed Activity Cards will help Leaders to identify how themes can be helpful in providing variety and balance in the delivery of the programme. It might not be the case that you could run all the activities on one meeting night and there is no expectation that you should, again these are ‘Pick and mix’ activities from which you can choose those that will work best with your children. This is a new resource for Leaders, supporting programme planning. The Programme Planner will be provided termly for each section and will cover every week within that term – providing ideas, highlighting national festivals and awareness days, signposting resources and identifying what fully resourced activities will be provided for that term. This resource will be provided a full term in advance of the period it covers, so for the Autumn term which covers September through to December, the programme planner will be delivered to the Leader in Charge a term in advance. Delivering this a term in advance will support Leaders in their programme planning and highlight which activities will be resourced through the Activity Cards and Themed Activity Cards, so Leaders know what to expect when they receive these with the Gazette covering that term (delivered a month before the start of the term). It is important that participation in the programme is recognised and rewarded and there are a number of ways this can be achieved. It is not intended that the programme has a formal ‘awards’ time, but that children and young people gain recognition for their participation in the programme as a whole. The Programme Awards will remain similar to those already in place for each age group but with refreshed designs and an optional badge for those working with 4-year olds in the Anchors age group. A slight change to the ordering of the awards for the Anchors age group will see the highest award being the Red Award, reflecting the age group colour (previously the Blue Award). The number of activities required to be completed for each award has been adjusted to recognise the change in having 6 Activity Areas, compared previously to having 5 Programme Zones. All the awards involve completing a minimum number of Activities in each Activity Area as well as 4 additional ‘Free Choice’ activities from across the Activity Areas encouraging a balanced and varied programme, but also providing some local flexibility. A new Membership Award is being introduced for both age groups which will be presented to new members once they have completed one activity in at least 3 Activity Areas and being introduced/inducted into the age group. Ideas for how members are introduced/inducted will be provided with Autumn 2019 Gazette. The Juniors Membership Award replaces the current Target Badge. The new Nights Away Awards will recognise and encourage overnight experiences, a key part of the programme and overall BB journey. The Nights Away awards will operate across all age groups with members moving up through the awards which range from 1 to 100 nights. For the Juniors age group there is the addition of a Project Award which aims to encourage members of this age group to take on a project, something that will require at least 3 hours of activity. A Project Award can be gained in each of the three years in the Juniors age group. To launch the new programme the Activity Cards & Themed Activity Cards will be sent out alongside the Programme Planner for the Autumn Term (Sept to Dec 2019) a full term in advance, so this will be received by the Leader in Charge of each age group in April 2019. This will provide an opportunity for Leaders to familarise themselves with the new programme and delivery, well in advance of adoption of the new programme in the new session. The normal distribution will see the Programme Planner card sent out a full term before and Activity Cards & Activity Themed Cards sent out a month before the start of the term. Badges and other resources available through BB Supplies from July 2019. Watch out for more information and updates as we launch the new programmes through the monthly eBB News emails and the Leaders website.